A controversial grading system for Texas public schools and districts, set for deployment in 2018, could dramatically change if the state's top two public education legislators have their way. 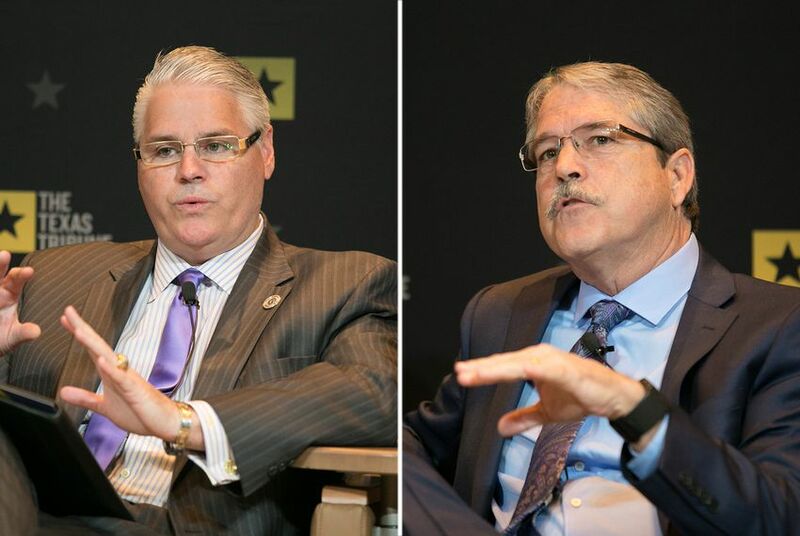 House Public Education Chairman Dan Huberty, R-Humble, and Senate Education Chairman Larry Taylor, R-Friendswood, have filed similar bills that that would condense the number of categories in which schools and districts get A-F grades and include factors other than standardized tests to grade schools. The original proposal pitched grades for school districts and campuses in five different categories: student performance on the State of Texas Assessments of Academic Readiness (STAAR) exam, student progress on STAAR, closing the achievement gap, college and career readiness, and community engagement. House Bill 22 and Senate Bill 2051 would grade just three categories total — student achievement, school progress and school climate — and include factors other than STAAR results, such as the rate of students enrolled in advanced courses. In the 2015 session, legislators approved an accountability system that would award schools and districts letter grades between A and F, instead of the current pass/fail system. Education officials who promoted a graded system said it would allow parents and communities to more easily understand how their local schools were doing. When a preliminary set of grades came out in January, superintendents and teachers started a statewide campaign opposing the proposed system, arguing the grades were too linked to the STAAR state test scores and did not reflect actual classroom learning. Now, members of the Legislature are working to implement a version of the system that's more in line with what educators want. While educators are still skeptical about whether letter grades can show parents the depth and range of programs in a school, they are willing to play ball this session. "It's not as though we are saying we're advocates for A-F systems," said Casey McCreary, assistant executive director at the Texas Association of School Administrators. "But we're appreciative that the chairs of public education on both sides of the Legislature are taking a look at what we can do to improve it." Alief Independent School District Superintendent HD Chambers, who helped craft Huberty's bill, said most people would probably say that Texas assessment and accountability measures don't work and that the A-F system is in dire need of an overhaul. "I think there's one last chance to keep it from going over a cliff," Chambers said. Proponents of the A-F system argue the proposals to change it do not include strict enough standards to hold schools and districts accountable for their performance. Courtney Boswell, director of advocacy group Texas Aspires, said the bills allow the commissioner excessive discretion to determine exactly how to judge schools — instead of holding them to the same tight set of standards. She said that although music and art are important, especially for elementary students, grading schools on student participation alone does not allow for enough depth. "There's no quality assurance here," she said. In its current form, Taylor's bill is less specific than Huberty's measure and allows the education commissioner more leeway to determine how to grade schools. Huberty's bill would include fine arts and participation in extracurricular activities in grading a district's student achievement. It would also allow districts to use scores on locally selected exams to determine their grade, as an alternative to using the STAAR test. It would not give schools or districts an overall grade. It would also delay the implementation of the system from 2018 to 2019 and require the Texas Education Agency to show educators two additional preliminary progress reports with unofficial grades. "That's to give the commissioner and the agency plenty of time to get this right," Chambers said. "It's not a stall tactic." Still, some educators are not excited about any A-F system. Dozens of rural students and parents dressed in bright red gathered in front of the south Capitol steps around Max Thompson, superintendent of Banquete Independent School District, as he railed against the A-F system Wednesday. Rural educators are concerned that the original system will penalize their schools compared with larger urban schools for not being able to offer as many technical education courses preparing students for a wide range of careers. "When you start looking at some of the schools that were Blue Ribbon nominees this year, you find Cs and even an F on one of those categories. The fact that schools are set up for a negative effect means that we're trying to show public schools are not doing good, and that's how the box was designed," said Thompson, a director at the Texas Rural Education Association. "To say we need to scrap the system that we have because 6 percent are not performing well? Well, 94 percent are doing a dang fine job, and we need to be heard." Educators argue the preliminary A-F grades contradict past distinctions they have received from the state. Proponents of the new rating system say it more accurately represents how schools are doing. Disclosure: The Texas Association of School Administrators has been a financial supporter of The Texas Tribune. A complete list of Tribune donors and sponsors can be viewed here.